These adorable coasters are so easy to make up! The coasters featured in the photos are made of one solid color, but they would also look great in multiple colors, or with Round 4 done in an alternate complimentary color. These would also be a great Christmas gift (or kids Christmas project) in Red, Green and White! This entry was posted on Saturday, October 23rd, 2010 at 7:00 AM by Erin Burger	and is filed under Free Crochet Patterns. You can follow any responses to this entry through the RSS 2.0 feed. You can leave a response, or trackback from your own site. Love them! They are so on my Christmas to do projects! Thanks! I like these, I just did one up quickly with some thick cotton and a 4mm hook. Didn’t take long, think I need to get some more colours from the shop! 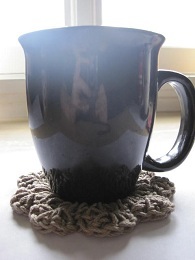 I’m not usually a fan of crocheted coasters, but these are great. Thanks, Erin!! These are awesome! Just the thing I was looking for to fill up my Christmas “kitchen” gift baskets! Thank you! Thanks Erin! These make nice little gifts and are good stash busters. How do you start a circle? How do you count dc’s? How do you do Round 4? Thanks! Hi, In the cool coasters 1 pattern, in the first round when you reach ch-4: 12dc, are you supposed to double crochet 12 more after you reach the ch-4? I got a little confused there. Hi Karen, the numbers after the colon is the stitch count for the round. So when you’re done the round you will have 12 double crochets. You don’t have to make another 12 double crochet. thanks so much for all your great patterns. i wasn’t very good at crochet but now i am doing well. these coasters came out great! i’m going to make a few in different sizes to make a set i can give for christmas! I made this pattern in Sinfonia in about 20 minutes. I added glass beads at the outer edge of each shell. It came out great! Thanks for a simple, fun but elegant pattern. Just made my 1st flower coaster. Thanks for the great pattern! Thank you so much for sharing this pattern…very kind of you. 🙂 The coasters are adorable! I use this pattern as my standard. 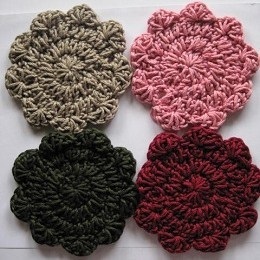 They make great gifts, work up quickly and are very absorbant when you make them with 4 ply 100% cotton. Mine seems to be curling up on the edges. Are they suppose to do that? I have made close to 50+ coasters since you first posted the pattern. They make nice hostess gifts. I made a few in holiday colors for friends that like to decorate for the holidays or seasons. I like to use any of the kitchen cottons like Sugar ‘n Cream by Lily. Aunt Lydia also makes the same thing. Sometimes you can find red and green with silver or gold threads woven through the yarn. I have made Victorian candy cane covers with this yarn. I love this website! These are amazing, easy and quick. Made them in craft cotton and are thick enough to absorb moisture and not leave marks on the furniture. Will make a few sets for gifts. Thanks for the pattern! I don’t know why they are different. Confusing. Quick and easy project for a last minute gift(s). Love them.